“Small Reprieve” is an outdoor public artwork by Miami-based artist Jim Drain. 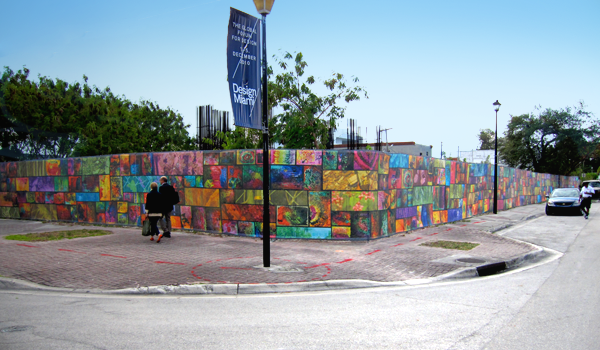 455 ft of vinyl fence wrap around NE 40th St and North Miami Avenue, transforming the façade of a neglected, vacant lot in the Miami Design District into a whimsical and beautiful experience. Drain collaborated with students from the Design and Architecture Senior High School to create the melted crayon drawings that when collaged together would become the imagery that evokes stained glass. Under Jim Drain’s art direction, Kaleidoscope was given the task of tiling the crayon drawings and photographs along the 455 ft span and bringing his artwork into full production. The project is a special commission through the support of art collectors Rosa de la Cruz, Asi Cymbal and Craig Robins.